You may be asking yourself, why as a pediatric feeding specialist, I would encourage parents to do food art with your child. 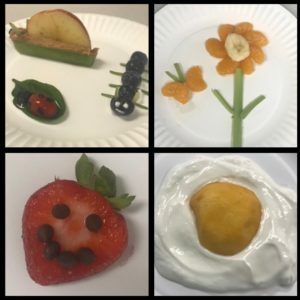 The reason is that through my experiences and some studies, playing with food actually helps kids to overcome fears of new foods, new flavors, and help toddlers & children to eat a bigger variety of foods in their diet. Many times the kiddos that I treat, would never want anything to do with a mandarin orange, but once it gets presented as a flower or a sunshine….it’s a whole new story! Kids need to be able to touch foods with their fingers comfortably, before they are willing to put them in their mouth. So if you see your child is not liking or wanting to touch certain foods on their plate, please consider doing some food art. 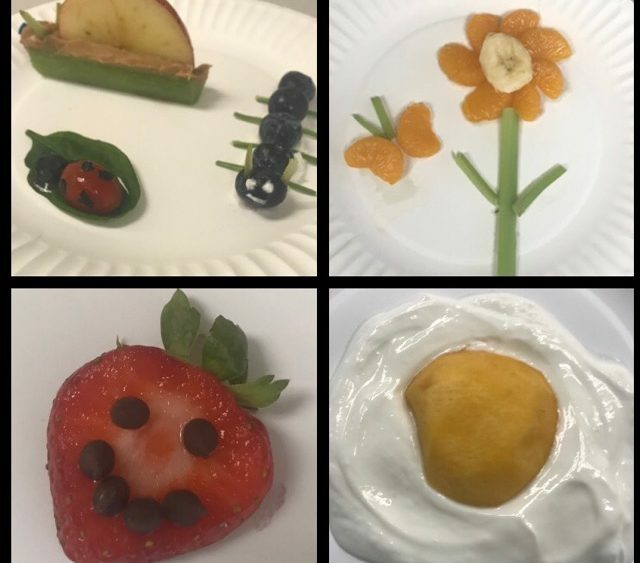 Making food art snacks, which are packed full of vitamins, help engage and motivate kids to interact with foods that typically were of no interest, feared, or have fallen off of their radar. Kids need really need exposure and interactions with a variety of foods if we are going to expect them to eat them. The options of food art are really endless! For those of you who are worried that you’re not creative enough, we have additional pictures and ideas to share with you. Please feel free to share your favorites with us!